This tax calculator is available free of charge to download and contains calculation formulae for the 2016 to 2018 tax years. The calculation formulae have been conveniently captured in a spreadsheet format which is unprotected, so as to give you maximum flexibility in checking and assessing your tax position. 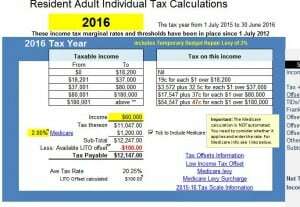 The calculator automatically includes the low income tax offset, and can optionally include medicare levies. There is also a scratch pad area where you can play with offset values (rebates), enter tax credits and see the outcomes on a weekly/monthly/ annual pre-and post tax basis. Note: For the accurate calculations of employee tax withholding (PAYG) obligations, slightly different formulae are used, and there is a specific calculator for that here. Use of the spreadsheet requires MS Excel Windows versions. To obtain the download simply email the words “tax calculator” to atotaxrates(at)fastmail.com. You will be immediately emailed a download link.